Selex Elsag Ltd has selected Teledyne Paradise Datacom to provide High Power X-band PowerMAX™ Solid State Power Amplifier systems to expand NATO static ground satellite communications in Belgium and Italy, and upgrade services in Greece and Turkey. Teledyne Paradise Datacom technology is designed to provide the Selex and NATO Satellite Ground Station (SGS) project with energy efficient, soft fail, high-power multicarrier-capable SSPA systems capable of meeting the needs of NATO forces now and into the future. "We are honored that Selex Elsag has selected Teledyne Paradise Datacom as a key supplier to this critical network, and we look forward to meeting the needs of NATO both now and in the future. 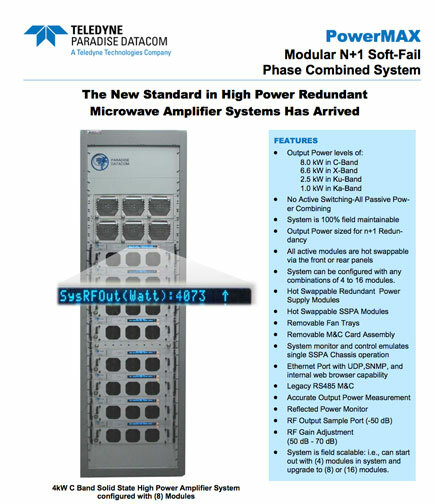 As a leading supplier of digital modems and RF products over satellite, Teledyne Paradise Datacom has always made a priority of developing innovative features to meet complex network requirements and we look forward to finding new ways to lower the TCO for our partners. ", said John Restivo, President of Teledyne Paradise Datacom. The value of the contract is around $2.5 million. 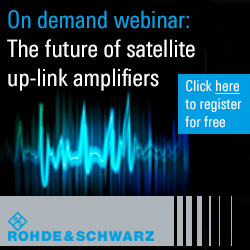 The order is for multiple 2 to 4 kW X-band PowerMAX™ systems. The new systems are scheduled to be installed and commissioned at NATO European sites with delivery starting in 2012. “NATO is the latest in a growing number of well-known entities who’ve adopted Teledyne Paradise Datacom’s (TPD) PowerMAX high-power SSPA architecture for their networks. The power-levels and efficiencies we’ve been able to achieve with PowerMAX has enabled us to address applications that, until recently, were reserved exclusively for tube-based technology”, states Steve Turner, VP of Engineering at TPD.